The Farm Service Agency office in Mayfield, Kentucky, is so quiet you can hear the tick of the Department of Agriculture-branded clock on the wall. Eleven employees usually make up this busy office. 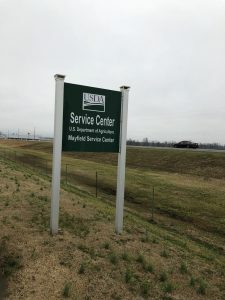 Only three were called in Thursday morning as the U.S. Department of Agriculture reopened Farm Service Agency offices across the country on Thursday. The offices will be open Friday and Tuesday, Jan. 22, for some limited services. Agency staff will help process loans affected by the federal government shutdown. Because of limited staffing, these employees are only allowed to help farmers make payments and file tax documents on existing loans that are due at the end of January. Many farmers were turned away because they wanted to sign up for other services. Tobacco and grain farmer Bob Galloway was interested in federal relief payments for growers affected by tariffs, but he will have to wait. “I didn’t know if this was covered. I knew they were taking loan money. But there’s so many things they offer and do, it’s hard to know. In the media, you know, one thing says this and the next thing says this, so we weren’t so sure. I just thought I’d stop in and check,” Galloway said. Galloway said the he needs those payments to make up for losses he’s taken from tariffs. Joe Schroeder is a former farmer from central Kentucky and a spokesperson with the farmer advocacy group Farm Aid. Schroeder said the longer the government shutdown goes on, the longer Ohio Valley farmers will go without access to FSA loans and services they need to keep their farms afloat. “I don’t know how they’re going to get through it. To be honest, I don’t know how this is going to work out. But it worries me. I’ve talked to people who are worried about it,” Schroeder said. FSA data show farmers in Ohio, West Virginia and Kentucky took out more than 3,000 loans through the agency in fiscal year 2018, totaling more than $438 million.